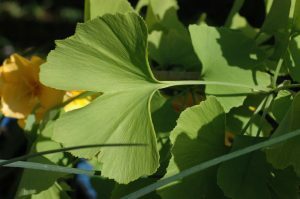 Ginkgo biloba or the maidenhair tree is unusual in many respects. It is often described as ‘a living fossil” - as is the horseshoe crab and the coelacanth . Ginkgo is a long lived, deciduous tree with distinctive leaves. The leaves are fan shaped (jpg adjacent), but notched or divided - forming two lobes (hence biloba) The leaf veins radiate out into the leaf blade from the leaf stalk - but do not form a network. Two veins enter the leaf at its base and these split into two again and again. This is known as dichotomous venation (see image). The leaves can be between two and four inches long, and have a long, slender petiole (leaf stalk). 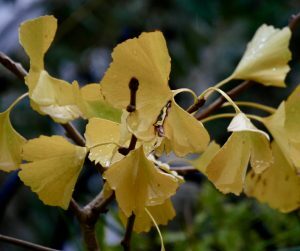 Apart from their physical appearance, the leaves of Ginkgo are unusual in term of the autumnal leaf drop. Most trees, like oaks or maples, form an abscission zone at the base of the leaf stalk at different rates, in different parts of the tree canopy over some weeks. This abscission zone stretches across the base of the leaf stalk, so that eventually the leaf has nothing securing it to the plant. The cells of this abscission layer are corky so that when the leaf falls, no living cells are exposed to the elements but a leaf scar is formed. Sooner or later, the leaf by virtue of its own weight, or hastened by high winds or frost - falls. 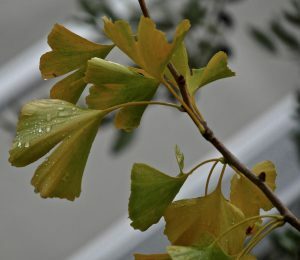 But the hundreds or thousands of leaves generally fall over a matter of weeks but the Ginkgo leaves (on any given tree) tend to show a remarkable synchrony in the formation of their autumnal yellow colouration and the development of their abscission zones so that the leaves tend to fall ‘in unison’. Most of the leaves tend to fall away in one day. 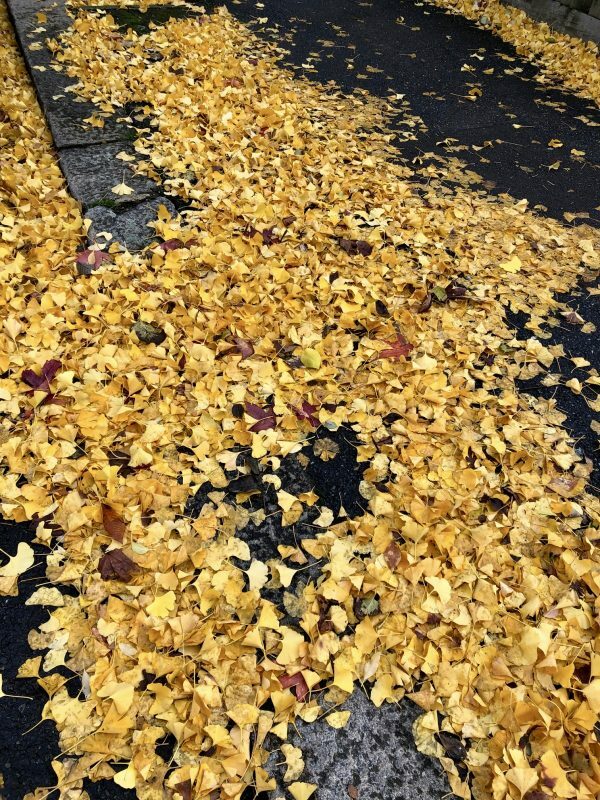 The ‘yellow carpet’ around the base of the tree has been observed and commented upon by many of the years, but now Professor Serita Frey at the University of New Hampshire has looked at the date of Ginkgo leaf fall and local autumnal temperatures. The autumn temperatures now are some 2oF warmer than they were in the 1970’s. She unearthed data on the date of Ginkgo leaf fall at the University over the years - which revealed that the tree was losing its leaves later over the decades. In the late seventies, leaf fall was on or around October 24, but has in recent times (2017) moved to November 9th. Thank you so much for this article. I have 4 ginkgo’s and I was always fascinated by the sudden appearance of the yellow carpet. Now it has been explained I will anticipate the date next season to see if all four drop on the same day, that would be amazing. 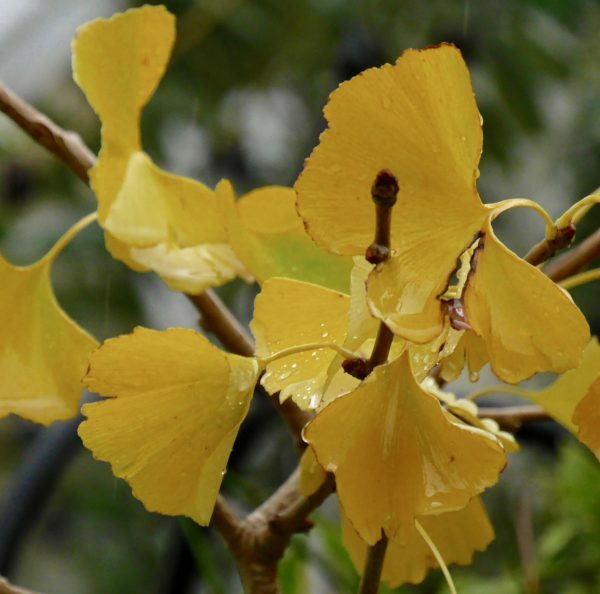 Unusual or exotic trees -the maidenhair tree, Ginkgo biloba.